We stayed one night but were very impressed with their friendly family run campground. No issues with any services. Site was level and easy to access. Would definitely stay again. Outstanding all around! We have stayed here several times and will stay here again. Nice clean, wide spots. Restrooms, showers and laundry are clean and exceptional. awesome owners and help every way they can. Stay here - you won't regret it! great people, nice campground, lots of things to do and explore, near by Memphis and Nashville. great history from civil war era, lots of fishing and site seeing. looking forward to visiting again. We recently spent a week at Green Acres. We've traveled all over the country & this is one of the most beautifully kept rv parks we have stayed at!! Check-in area, showers, restrooms & laundry were extremely clean & appealing. Grounds were beautifully maintained! The owners & staff were extremely welcoming, friendly & helpful. We were provided with a lot of information on the area with much to see & do. Great restaurants in the area. Can't say enough about this park & look forward to visiting again!! We stayed here last week on our way from Lynchburg to Memphis. What a great little park. Everything was so clean. The owners and workers were great. They went out of their way to help us. They also told us a different way to get to Memphis and printed it out for us. We will definitely stay here again if we are in the area!!! This is a great place to stay. Everything was extra clean. Host and Hostess were really nice. I loved this campground! The staff was extremely friendly and helpful. The restrooms were clean andso were the showers and laundry room. It has every convenience nearby that you could need. It was easy to get to, maneuver within and the sites were spacious (we had a back-in). We were there in April so not much going on at park but it looked great. The only thing that I would change is possibly a better store area with more available. Most of all, it was a very reasonable price! We were visiting Shiloh National Park....I would go back there in a heartbeat if I was in the area again. The staff were knowledgeable of the local area and extremely friendly. The sites were level. They had recently had a lot of rain so the roads were slightly muddy. Also, a music festival had been held a few days before our arrival so the camp staff were still cleaning the areas from an apparently large crowd. We did not use the restrooms or laundry facilities. We camped in a 35' 5th wheel. We would still here again. My stay was from April 4-5 2018. This is not my first time here. This park has made many improvements to the RV sites. They had a major storm the night we pulled in and will have to repair their shelter area for equipment. Our packet was waiting for us, as we arrived after normal hours and the next morning the staff was set up to finish the paperwork, we love this park because the owners and staff are flexible and extremely helpful and other campers are happy to relax at this small family owned park. I highly recommend this park to anyone looking for a quite camping area. Green Acres was very clean and the owners and employees were very accommodating. Everyone goes out of the way to help. Laundry was clean and a good price, bathrooms neat and clean, and the sites were well kept. I would definitely recommend this resort to our friends. Our good sam club from N. Al. has stayed at Green Acres for the last 4 years and have watched as the owners & hosts have improved the grounds. They are warm and caring towards all of their guests and always call you by name. This camping resort is a work in progress as they are always improving it. This outing with them we saw the addition of 12 new sites with full hookups which will be ready to use within a few more days and they have more area available to develop in the future. The sites are large enough to be comfortable and level. They have a nice enclosed pavilion for guest to use and we have really enjoyed it since it was built. As I said earlier we have been there for the 4 years they have owned the campground and plan to continue. Our group made reservations for 2018 before we left to go home. Owners were very friendly and accommodating. Campground was very well maintained. Highly recommended!!! Shiloh and Corinth both easily assessable to park. Staff very friendly and helpful. Park new, up to date, clean, quiet. Would stay here again. We stayed a few nights as we traveled through the area. Personnel very helpful and accommodating. Helped with area recommendations and provides friendly welcoming atmosphere. Stayed here 2 nights while visiting Shiloh Battlefield. Park was clean and nice looking with very friendly staff. Provided us a list of area restaurants and attractions. Also provided us with a brochure on Shiloh and directions how to get there. We were in spot #33 which was a back in site. Spot was very spacious and had room on both sides so not on top of other campers. Spot was level with no need for any blocks under jacks or tires. Had a nice laundry facility and a pool. Didn't use the restrooms/showers but based on everything else I would assume that are top rate also. We stayed in a 38' Class A Motorhome with tow dolly and had no problems fitting everything on our site. Would definitely stay here again if we come back this way. Wonderful staff even helped us set up since this was out first time. Easy to park and set up. Just wish they had a few more trees. Great RV park to stay at. Looked at Good Sam ratings before choosing this park and their rating is correct. Hook ups, rest rooms, and showers are very nice. The staff is very friendly and helpful. Would definitely stay at this park again. This is a beautiful campground and the staff and owners were very friendly and helpful. We enjoyed our stay there very much and will definitely stay there again if we're in the area. Highly recommend it. First time here. Very nice CG. Friendly and helpful staff. Very large site. Plenty of room for a big rig in the pull thrus. Whole campground looks clean. No shade on our site. Hook ups were easy. Good cable and wifi. Salt water pool. Watch your GPS. Ours tried to confuse us. Easy drive to Shiloh National Battlefield. Will stay here again when in the area. Need additional information about the WiFi. Like requirement for going on line to activate system. RV spaces could be flatter so blocks under wheels are not required. Very quite. 7 miles outside of town. Friendly people workers and other RV people. Grave sites very good. Just got home from a 3 night stay at Green Acres, the park was well maintained and the friendly staff and owners made us feel right at home. We diffidently we be staying again with them. Best customer service I've received in an RV Park. Our stay was very enjoyable, everyone was very friendly and nice. The park is very well kept. The pool was great!! We used the laundry very clean and worked nice, open 24 hours. We did not use reastroom or bathhouse facilities. We just stay at Green Acres this week. This is one of the best parks we have stay at. The owners and workers take pride in this RV Park, and it shows. Would highly recommend it. 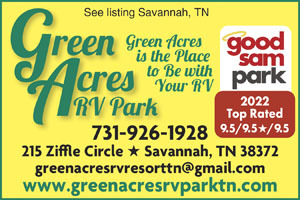 Green Acres RV Park is the best all around Campground in west Tennessee. This was our 3rd time here and a;ready have reservations for another time later this year. The owners are awesome. They are continuing to improve every aspect of their property. You will not be disappointed. The welcome and hospitality is second to none!! If you are looking for clean, quiet, place to stay this is it! The owners have gone overboard in providing every possible convience a camper could ever want. The wifi is the best I've ever seen! There are no dead spots in this park! The cable tv is a huge bonus. The laundry and bathrooms are impeccably clean! The swimming pool is beautiful. The entire park is sooo clean! While hooking up the owners and staff stopped by to welcome us. They checked in on us from time to time to just to say hi and see if we needed anything. We will be staying here again and again! It's our new favorite place. The new owners of this campground have really made the facility into a top notch resort. Congratulations to them. 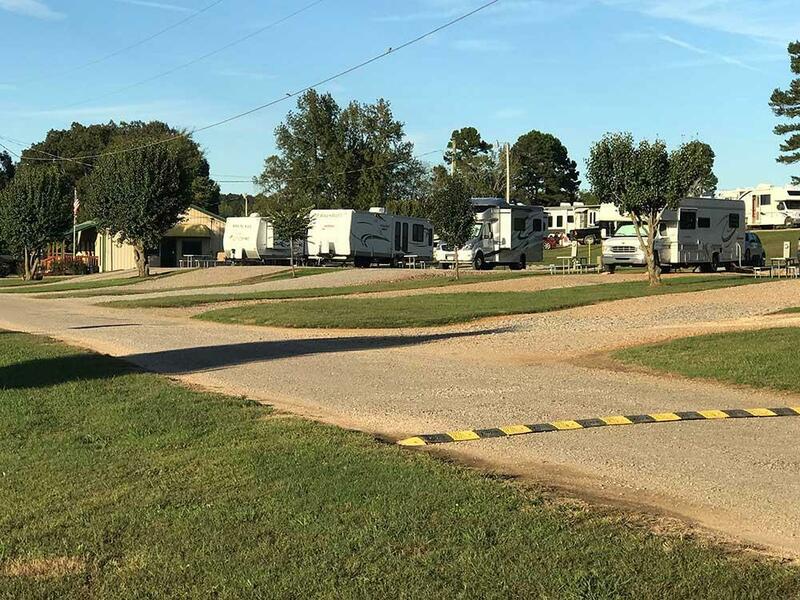 Savannah and Pickwick lake needed a smart place for campers to stay. Very nice place to stay. People are very friendly and helpful. Great place to stay when visiting the CW battlefields. This Park would rate amongst the best parks. My husband and I stayed for a month and it was a great place to be! The owners are awesome very friendly and welcoming! The cleanliness of the park, along with the flowers and spacious sites, with everything so well maintained really shows the pride and caring they have for their park and the guest who visit. We loved the area and throughly enjoyed our time there. We will definitely come back ! It is worth a visit if you are in the area or just want to see a beautiful part of Tennessee! We original stayed in Nov for Thanksgiving (3days), then found the CG would `do storage, so we left our 5er for the month of Dec, owners where very flexible,about the storage, we gave no advanced notice, Before leaving the CG we made a reservation for Jan. 2016 The stay for the month was very relaxing and we felt welcomed the time we spent there. The Laundry and restroom where alway clean. the pool is not available in winter monthes. Besides it snowed on us twice and cold quit a few days, which the owners sent a email out in advance with information about protecting the water systems. I'd recommend this CG to all and will be staying again. Nice people, Nice clean camp. Looks newly renovated.5 to ten miles from town and attractions. Will stay again if in the area. Spent four days here in late November. Our interest was Shilo National Battlefield. This was a good location to see the Battlefield and related sites in Cornith. The campground was well organized and clean. The staff was particularly helpful - more like a concierge service. I was impressed with the way all the utilities were laid out. Please note that to receive a five from me the campground must have something extra special like a lake, river, extra quiet. I would not hesitate to stay here again. etc. if I could give her 4.5 I would. Our Good Sams chapter has stayed at Green Acres several times. The owners really aim to please and go out of their way to accomodate groups and individual campers. We have already planned 3 more rallies at Green Acres next year. This is a very nice campground with many interesting attractions within a short driving distance. For the second year in a row Good Sam chapter Bluff City Sams from Memphis TN chose Green Acres for our final campout of the year and plan to continue to do so. We could not ask for a warmer welcome from the owners and their entire staff. They all "bend over backwards" to make sure we as individuals and as a group have the best experience possible. Any issues that are brought to their attention are handled ASAP. The campground allows groups to use their meeting building which heated up nicely with a patio heater the owners were gracious enough to provide. In short, whether you are traveling as an individual or as a part of a group, Green Acres is an excellent choice. OK, I can't resist "Green Acres is the place to be"! Beautiful campground! Very large sites and lots of grass for our pets. Staff were extremely friendly and very attentive to the campers needs. This was our first time camping here but definitely wont be our last. Thank you for a wonderful Veterans day weekend campout! This park is very clean with level gravel spaces and lots of room to get around with our Class A Motorhome. This RV park was very relaxing and enjoyable. The staff was friendly and helpful. I did not go into the restroom but the laundry room was one of the cleanest I've ever been in. Would love to stay here again. Thanks. We enjoyed our stay at Green Acres. It is close to the Shiloh National Battlefield and Corinth. The staff was friendly and helpful. We did have some trouble with the Wifi on our Apple mobile devices, but the computers worked fine. We were lucky enough to stumble onto this campground after a long, frustrating day. Would we stay there again? In a heartbeat. The was staff was very friendly and accommodating.Beautiful grass covered grounds with concrete pads generously spaced . A little overboard with praise, not at all. This park was very well thought out with RVer's in mind. Would highly recommend staying here. PS: Our dog also gave a five star rating!! Only gave bathrooms 4 stars. They were spotless, but need the taller heads. Overall small park but super nice. Nice LARGE level sites with 50 amp. Staff amenable and owners try to stop by to say hello. Relatively close to many attractions. Stay awhile and enjoy! Local roads are more than adequate for large RVs - ours is a 45' MH. What a stop this was, something that you can not find anywhere else in Tennessee. It was a pleasure to stop over for 2 nights. The owners stopped by to see if everything was ok and did we need anything? Lots of room as we have a 5th Wheel - 40 foot - 3 sides and we fit with no problems. Would we return, yes we will, it's in our book for campground to return to.. Spacious, gracious and clean. What more could you ask for except value and Green Acres is a great value. Can't imagine a nicer RV Park! Great people and the most helpful I've ever met. Large sites and well kept. When in the area, we'll be back. Very clean park. Could use a few more trees and some of the sites are a bit unlevel. Staff we dealt with was extremely friendly and helpful. Really good cable and WiFi was strong. Showers were in a strange place being off the laundry room. Overall a very nice park and I wouldn't hesitate to stay here again. Able to get a pull-through on Labor Day weekend which was a pleasant surprise. Owners had live entertainment on Saturday Night that was family friendly and the band was great with music that span different generations. The owners and their staff were first class and very friendly. They were always present making the campground clean and user friendly. We do plan on going back as soon as we can! The camp facility was very good, but would be nice to have an A/C meeting room and showers. Also, maybe a tour bus to various areas if interest. No campfire rings found. This was one of the cleanest RV parks I have stayed. The spaces were spaced very nicely, the grounds were clean and beautifully landscaped and the restrooms, showers, laundry room & pavilion were VERY clean. The staff was very friendly and did great job making sure everything was good with our stay. This is a great campground! The staff is very nice and helpful. The grounds are very well maintained and they are constantly working to keep it that way. The hookups are all in decorated rock so any overflow will be absorbed in the rock. Very well thought out. We did not use the showers or laundry, but they looked very nice. The pool looked very nice also, but we didn't use it. If I had to say anything negative, I say they need an exhaust fan in the public restrooms as they are very hot. But I only used them once before we left when we had already unhooked our RV. Definitely a Great place and would love to go back! we absolutely love staying here everyone is so friendly and the place is clean and quiet, we would highly recommend this place anytime of the year . One of the nicest parks we have visited in the country. Large spaces. Also close to beautiful lake and to Shiloh battlefield. We will try to get back here again. Our stay at Green Acres was for two nights. Our original spot in the camp didn't work out for us but thankfully they found a spot that would. Beautiful area to camp in! Even pick up your garbage at your site! Although we did not use the pool, it looked inviting! Nice country location! This is a great campground for relaxing!!! Staff is super friendly and everything is very clean and neat. It was a pleasure to stay here!! This was my 3rd Memorial Day weekend stay at Green Acres. When I was there the 2nd year, and again this year, the owners remembered me, and where I liked to be parked. They know that if there is not a pull-thru site available that I need help backing in, and it is provided willingly. I was greeted by name by them and others, and made to feel like a family member. The facility is extremely well maintained, and in the 3 years they have owned it, a huge number of improvements have been made. This campground has spacious sites, and you don't feel as if you are camping in each other. Although there is not a fenced in area for pets, there are bags and disposal containers located in convenient locations. There is lots of open space to walk my pup. I plan to be back again! What a great place! Try a different nearby catfish restaurant every day, but pace yourself. We'll be back. Green acres is a very nice park. Clean and neat. Check in was a breeze even without a reservation. A well run park, we would stay again. A great campground run by very nice folks. We will return next trip south. Wide long sites with good hook ups. Easy in and out and close to historic sights and restaurants. Great place to camp. Great hosts. Very nice people. This was a great campground with pull through spaces, plenty of room between them, and (very important to me) great water pressure. We went to West Tennessee to visit Shilo battlefield and Corinth. Compared to the other campgrounds in the area, Green Acres is paradise:). Only one thing about the appeal of the park, not enough shade but give them time and it will grow. The staff was extremely helpful and inviting. They welcomed us to the park and guided us to our space. We stayed three nights. From Jct of US-64 & SR-128 in Savannah: Go S 5.9 mi on SR-128 (L).